Attendees of the 2016 Esri Developer Summit learned how to work with smart mapping and real-time GIS, build apps using APIs and SDKs, and use drone imagery with ArcGIS. Drones, imagery, video, sensors, real-time data, mobile 3D, big data, the cloud, the Internet of Things (IoT)—all these are impacting how geospatial data is collected, analyzed, visualized, and shared. 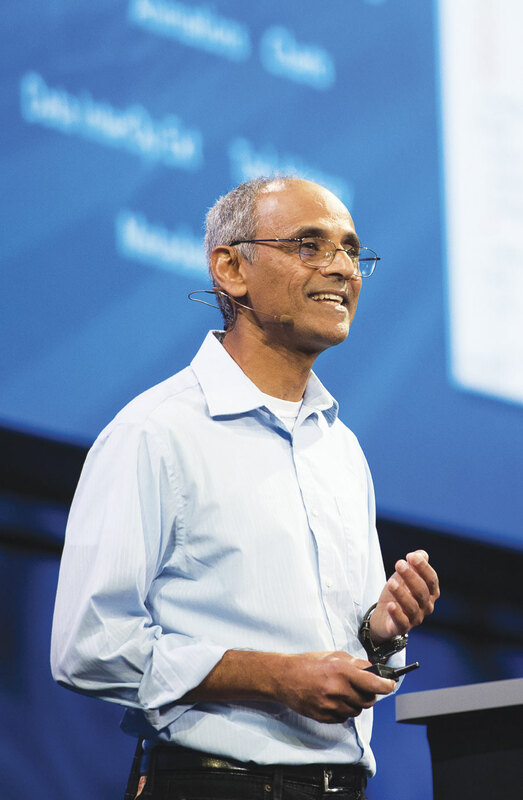 “Our world is changing,” said Esri software development director Sud Menon during the opening of the 2016 Esri Developer Summit (DevSummit). 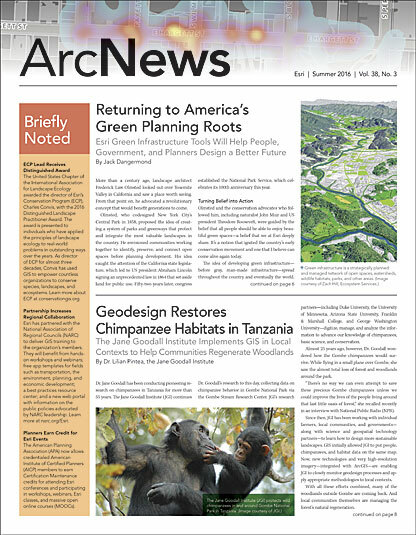 “And ArcGIS is changing too”—to embrace this new reality. The focus of DevSummit—which drew more than 1,700 people to Palm Springs, California, in early March—was how ArcGIS is evolving in this rapidly innovating landscape. Amid technical sessions on app development, there were talks on real-time GIS and analytics, 3D web GIS, live data deployment, wearables, the IoT, and drones. Future updates to ArcGIS Online that will give users the ability to host vector tiles, create configurable 3D apps, and perform advanced analytics. Field, office, and public apps that work together—like Navigator for ArcGIS, Collector for ArcGIS, and Survey123 for ArcGIS, which all provide real- or near real-time information that can be monitored on Operations Dashboard for ArcGIS. Drone2Map for ArcGIS, which turns still imagery from drones into 2D and 3D imagery products that can be used for visualization and analysis in ArcGIS. 3D mapping across the platform, which is powered by an information model that uses web scenes and 3D layers. Substantial enhancements to the real-time infrastructure in ArcGIS 10.4, including faster data ingestion and storage rates. A new Spatiotemporal Big Data Store that supports archiving observations that come in at high velocity. Software development director Sud Menon highlighted several Esri initiatives that are driving the new age of intelligent mapping. In the months ahead, Esri will bring together big data, standard data, business data, and GIS data to help organizations leverage their information, observations, and assets in new ways that help them gain enhanced insight. To help users analyze their data more easily, Esri is devising a whole new application experience. Data alone does not provide meaning, but a thorough analysis of it does. 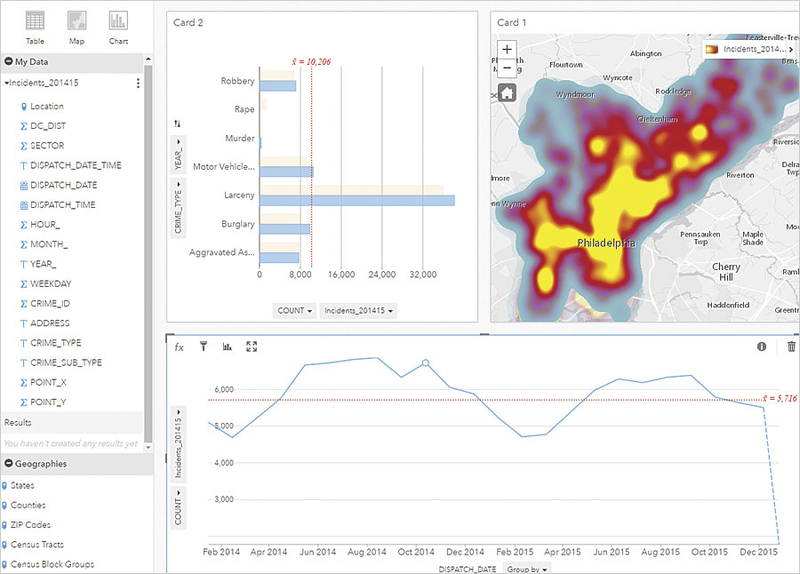 Insights for ArcGIS, slated for release later this year, introduces new, easy ways to interact with data, explore it, and analyze the results. Users will be able to drag and drop data (including enterprise data) onto digital cards that display the information as maps, charts, and tables—or all three. They can then analyze their data right on those cards. Esri product engineer Linda Beale demonstrated Insights workflows using crime statistics from a major American city. As her cursor touched various data points on a timeline that charted the number of residential burglaries in an area over a two-year period, a map next to the chart displayed the burglary locations as points. Beale then switched to a heat map of the burglary locations. “Now we can explore those [crime] patterns changing over time across the city,” she said. With Insights for ArcGIS, users can drag and drop data onto digital cards that display the information as maps, charts, and tables. She created more cards—maps, charts, and tables—as she dove deeper into her analysis. Kacey Johnson Pham, GIS manager for Los Angeles-based International Medical Corps, was amazed by Insights when Beale gave her a one-on-one demonstration of it later. Among the many presentations at DevSummit aimed at making things easier for app developers was a preview of the next generation of ArcGIS Runtime SDKs, which are used to build native apps. Of particular interest was the Quartz release. “With Quartz…we are releasing a significant set of functionality for you as developers,” announced Euan Cameron, chief technology officer for the Runtime group at Esri. The new functionality includes improved APIs so developers can build better apps and devise more fitting methods for constructing cross-platform native applications. It also contains support for content stored in the cloud or locally on devices, performing analysis locally or through geoprocessing services, and 3D visualization and analysis on Runtime supported devices. Keynote speaker Douglas Crockford advised app developers to edit their programs down to just the essentials. Over the course of the summit, attendees listened to dozens of presentations. They learned about how to work with smart mapping and real-time GIS, build apps using APIs and SDKs, extend and automate ArcGIS, create 3D scenes and share them as 3D web apps, and use imagery from drones with ArcGIS. Johnson Pham said real-time GIS was of particular importance for her work with International Medical Corps, a nonprofit that provides medical assistance to people impacted by war, diseases, and natural disasters. Additionally, as a volunteer at the tar pits, Johnson Pham has created a web app of fossil discoveries, including saber-toothed cat skeletons. She hopes to someday build an app for an interactive exhibit at the museum—and she thinks that live data could play a role. Johnson Pham was not the only one teeming with ideas. 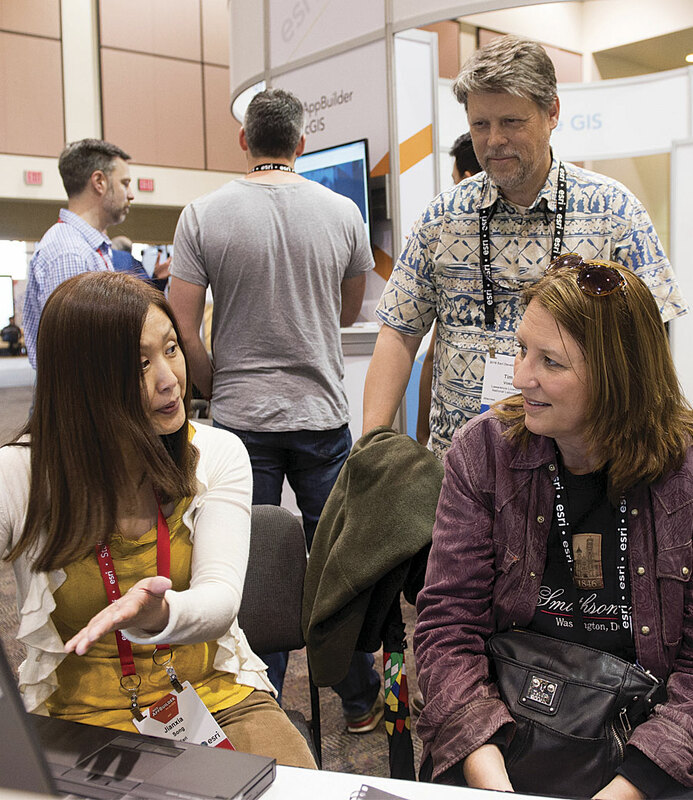 After spending four days soaking up information and inspiration, DevSummit attendees were abuzz with new ways to develop with GIS and new projects to take on once they got home.